With Streamline it’s simple! You record or dictate anytime, anywhere, and we take care of the rest. Some options can be selected from the enquiry form on our contact page. Otherwise, get in touch with us and we’ll get back to you promptly to discuss what you need. Can my business improve productivity by working with Streamline? How do I get my sound files to you? How are my files returned? What file types and apps do you work with? What do your audio to text transcription services cost? Why don’t you charge by the audio minute? Are my files confidential and secure with you? How long does it take to transcribe audio to text? What turnaround options do you have for audio to text transcribing? What do you mean by “transcription types”? Can you take care of my typing needs as well? Do you recommend or support audio equipment? When professionals work with an aligned team of administrative experts, greater levels of support to manage time and productivity are attainable. As a result businesses start to function on a whole new level, with better workflow, improvement in bottom line, and lifestyle improvements. Essentially, you get more time back, you’re not drowning in work, there’s better work life balance, your clients’ needs are being met faster and you also have time to grow your business. taxes such as PAYE, ACC levies, insurance, etc. View an example of the money you could save. 1. Dictate your work, or record your meeting into a digital dictaphone or smartphone app, creating a sound file. for transcriptions of podcasts, web conferences, or video, send us a link to your content. 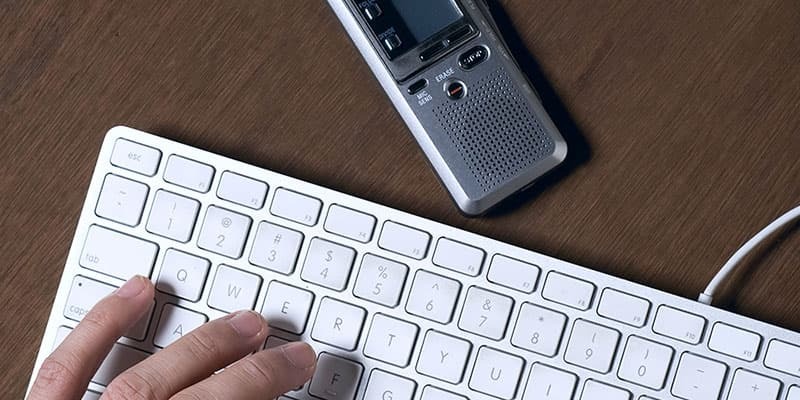 We transcribe the audio according to your requirements for formatting, style, and transcription type. Then we return your transcription in a Word document either by email or via a secure file sharing system such as Dropbox. We can also work directly into your information management system if required. We are able to work with most digital formats and apps. Our common formats are DS2, DSS, MP3, M4A, WMA and WAV. The first option is to pay for what you use at on an hourly basis. This would be the way to go if you require our services occasionally. The unique software designed specifically for our needs allows us to electronically track the time we work on a document, so you pay only for what you use. We charge you in your own currency. The second option is for us to put together a package deal where you pay a set amount every month. This is for clients who require a regular daily or weekly service, and the set monthly amount provides budgeting certainty. We made a conscious decision that authors of good recordings would not have to pay for the “not so good recordings”, hence we charge by the typing hour. Yes, your files are safe and secure in our file repository within our office. We do not share your information with other clients, and your files are not retained once we’ve completed the work. We always uphold our clients’ confidentiality. Our team all work in our office, which means that your work is always completed in a secure environment. Additionally, each typist is carefully vetted and completes a confidentiality agreement prior to commencing with us as well as their employment agreement. The rule of thumb is: if we’re working with good, clear, quality tape with one author, we expect this to take 3 to 3.5 times the length of the tape to type, format, and check. For example, a 10-minute tape of clear recording with one author would take us 30 to 40 minutes to type. Your work is returned to you formatted to your business specifications, or we’ll create templates for you, if required. This ensures that your transcriptions are fit for purpose and won’t need extra formatting by your busy staff. We work with our clients to negotiate the best turnaround time for them. Generally speaking, work received before 12pm will be returned by the end of the day. Work received after 12pm will generally be returned by 12pm the following day. This depends on the length of the recording and the arrangements that have been made at the outset about transcription type, and formatting. There are three types of transcription – verbatim, intelligent verbatim, and edited. Verbatim transcription captures all parts of the spoken language present on an audio recording, including “ums and ahs”, throat clearing, incomplete sentences, pauses, laughter, and background sounds, as well as the words themselves. Intelligent verbatim transcription leaves out the “ums and ahs”, laughter, pauses, and other incidental sounds in the conversation. We lightly edit the text to correct sentencing and grammar and delete irrelevant content. Edited transcription is audio fully and accurately transcribed in a formal manner and edited for legibility. This is useful for content intended for publication. The transcription type you require largely depends on the purpose of your content once it’s been transcribed. We place a high degree of importance on correct formatting. It makes all the difference to have transcriptions that integrate easily with your business documentation. We format transcriptions according to your style, or we can create a suitable format for output using a template from our library. We can provide you with samples of our formatting. Can you take care of my typing as well? Yes, our very quick typists can type all your business correspondence. We will return the completed documents to you by email, or we can work directly into your office system, along similar lines to our audio to text service. We can help you decide on the best equipment to suit your needs. We support Olympus digital audio hardware and their smartphone app. The app works on either iPhone or android and is a great option for those of us on the run. It’s versatile, quick and easy to set up, and produces high-quality sound with all the operational benefits of a dictaphone. Recordings on the app are instantly available for transcription by us, making an urgent turnaround easier to achieve. We can set you up with the Olympus smartphone app instantly with a paid account and give you a free trial.